Exploring the same kind of conflict within a narrative results in a common structural conceit. The types of conflict within a story carry with them a unique narrative code, much like the genetic code within DNA. And just as a different combination of certain genomes determines the eventual type of human they’re responsible for, the mixture of these dramatic narrative forces decides the personality of a story. But why is it that some stories seem to have the same personality? If built on such complex genetic code, how do they all end up feeling the same? Avatar was just Pocahontas, which itself was Dances with Wolves which itself spawned The Last Samurai and possibly Fern Gully. Regardless of the setting, all of these stories feel the same. While most would attribute this similarity to Campbell’s monomyth, the truth of the reality is there is something deeper and more purposeful going on. 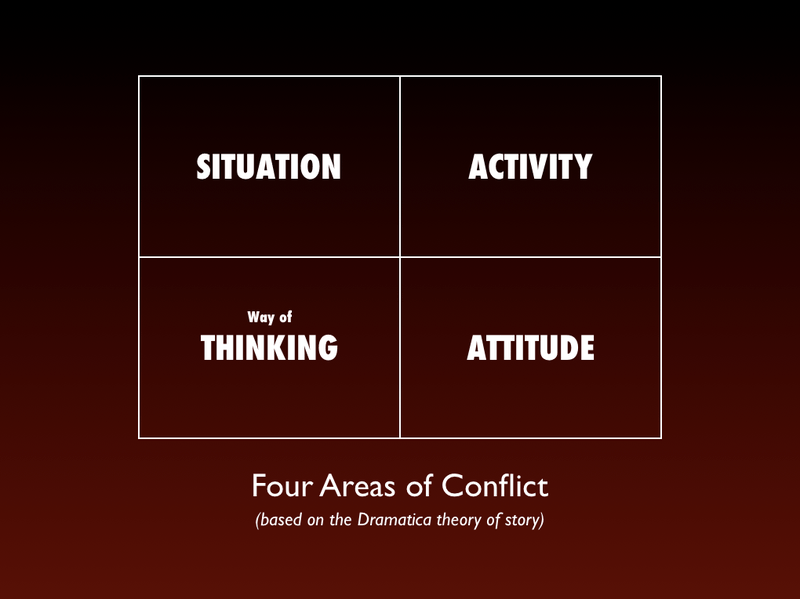 Earlier in this series on conflict, we explored the four major areas of problematic conflict as outlined by the Dramatica theory of story. Whether it be a Situation, an Activity, a Thought Process (Way of Thinking) or a Fixed Attitude, a problem must find a home somewhere within this chart. In addition, we discovered that a successful Author attaches the four major Throughlines to these areas in an effort to effectively cover the entire scope of what it is they are trying to say with their story. Main Character, Influence Character, Relationship Story, and Overall Story. Four Throughlines, four general Areas of Conflict. Put a throughline in each area and the story will feel complete. Attach them in a similar pattern to other stories and the stories themselves will begin to feel strikingly familiar. Where an Author decides to focus the conflict in their story defines the personality of that story. A popular combination, especially in Western culture, has the Main Character in a Problematic Situation, the Influence Character in Fixed Attitude, the Overall Story in Activity and the Relationship Story in a Thought Process. Why? Chances are the prevailing gender behind most Western film (i.e., men) find it more comfortable placing a conflict they don’t understand (Thought Processes) in a throughline they generally don’t get (Relationships). Regardless, the films listed above all follow this same pattern. They feature a Main Character who is essentially a fish-out-of-water or a stranger in a strange land (Problematic Situation). They find a strong-willed native defined by what they believe (Problematic Fixed Attitude). This belief forces the Main Character to grow, to reconsider how they approach things. Naturally, the two develop a Relationship that involves changing the way they both see things (though more often than not, focusing only on changing the Main Character’s Thought Process). And all this happens against the backdrop of evil colonists consuming and devastating a peaceful landscape (Problematic Activity). More than myth, these films sharpen their lasers of dramatic focus upon the same targets of conflict. But what if we moved beyond simply focusing on the descriptive commonalities of setting and storytelling, that of the “white” colonist in a strange native land, and instead focused our attention on the types of conflict within each throughline. Would other popular American Western-culture films follow the same patterns of conflict? The perennial classic Star Wars follows this same pattern. Luke Skywalker finds conflict in a Problematic Situation—farm boy stuck at the outer edge of the galaxy. His Influence Character Ben Kenobi, the one responsible for motivating Luke’s personal growth, sits directly across from him in the Genre chart. 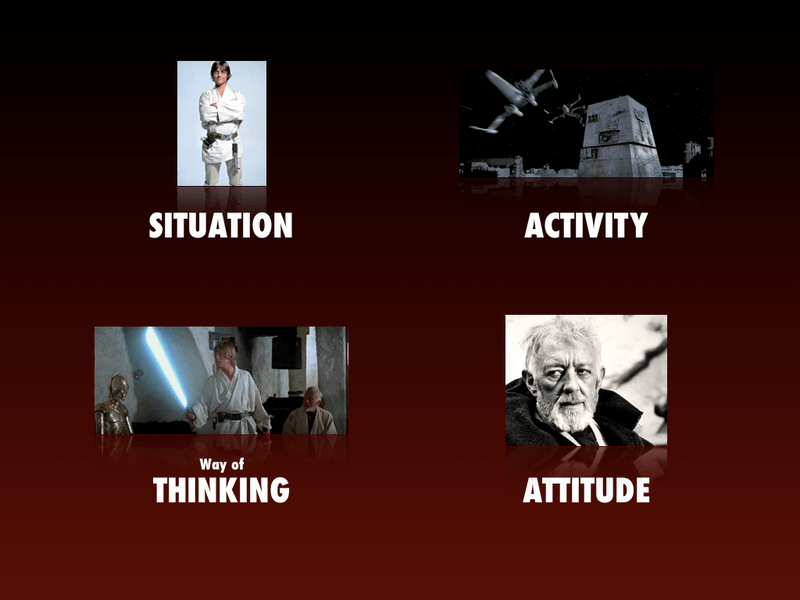 Fixed Attitude defines Old Obi Wan—his belief in the Force and its power to transform lives shows no signs of wavering. In this respect, Ben’s impact on Luke calls to mind the same dramatic forces found in How to Train Your Dragon. As explained in the article A Conflict Unlike Any Other, Hiccup’s diminutive status (Situation) found great resistance in his father’s strict mindset (Fixed Attitude). But unlike Stoick in that Viking epic, Ben’s Fixed Attitude in this space opera is a positive influence. This is yet another example of how Dramatica’s take on story structure refuses to dictate how to tell a story point. It does suggest the thematic substance of the story point, but how it unfolds, positive or negative, rests in the talent of the individual Author (as it naturally should). Looking at the other two Throughlines, Star Wars continues to follow the same pattern. The main story, or A story line, centers around Problematic Activities between the bad and the good—stealing plans, storming diplomatic ships, shooting lasers, blowing up planets—all interstellar conflict defined by activity. In the other corner sits the Relationship between Luke and Ben and that common exploration of Problematic Thought Processes. Beyond Luke’s issues with where he is and Ben’s attitude towards the Force, the conflict between them adds that key missing ingredient needed to make the story complete. Often, when viewed within the context of a relationship, this special corner of the Genre chart looks more like Manipulations rather than Ways of Thinking or Thought Processes. Technically, they all mean the same thing, but due to the fact this is a problematic area of the chart for many Authors to understand (the aforementioned Male half of the population), the shorter definition eases the comprehension. Ben manipulates Luke to think the way the old wizard does: be one with the mystical ways of the Jedi Knights and you too can do miraculous things. These manipulations define the tension in their relationship and offer the final cornerstone that completes the story’s exploration of the inequity. As with the constant comparison between Avatar and Pocahontas, many compared The Matrix to Star Wars? When we first met Neo, many likened him to Luke Skywalker. Morpheus looks like a modern-day Obi Wan. Again, Campbell was often the center of such conversations, but those discussions were missing the trees for the mystical forest. Like Luke, Neo finds conflict in a Situation - he is the One and doesn’t want to be. Like Ben, Morpheus believes strongly in one thing: in this case, that Mr. Andersen is the savior he has been waiting for. Instead of space battles and laser-sword fights, The Matrix features kung-fu fighting and over-the-top gun battles. Yet still all found under the umbrella of Activity. 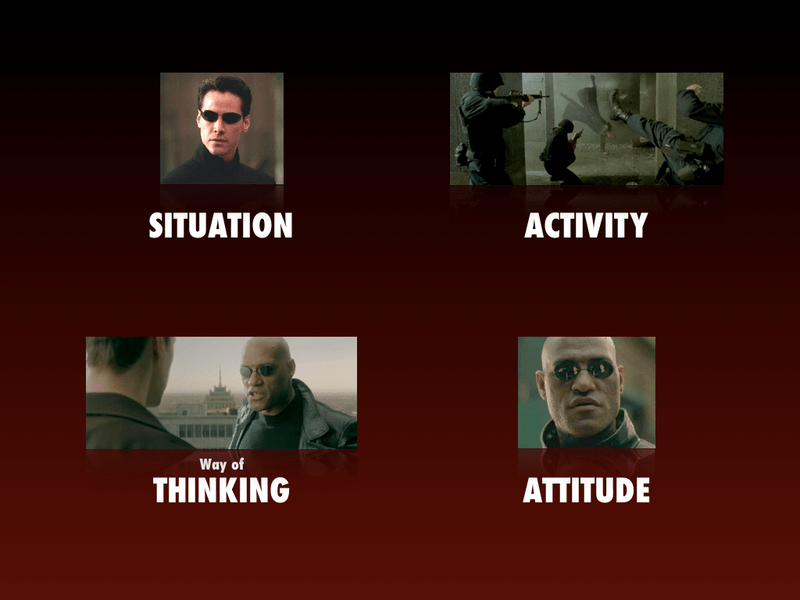 And finally, like Luke and Ben, the relationship between Morpheus and Neo is one of Manipulation (“Free your mind…”). 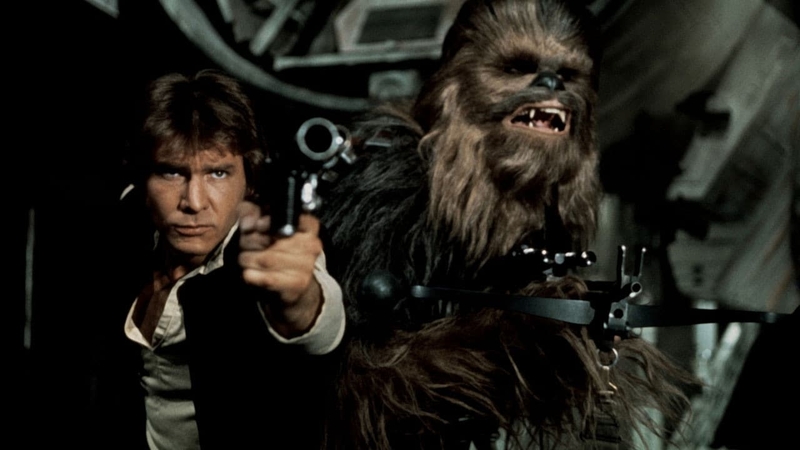 Beyond simply aping a sequence of “mythical” story beats, the writers behind The Matrix managed to assimilate the exact areas of conflict found in Star Wars. That familiar feeling between the two is more than the stuff of legend, it is quantifiable dramatic focus. This popular pattern extends into the animation sector of modern American animation. 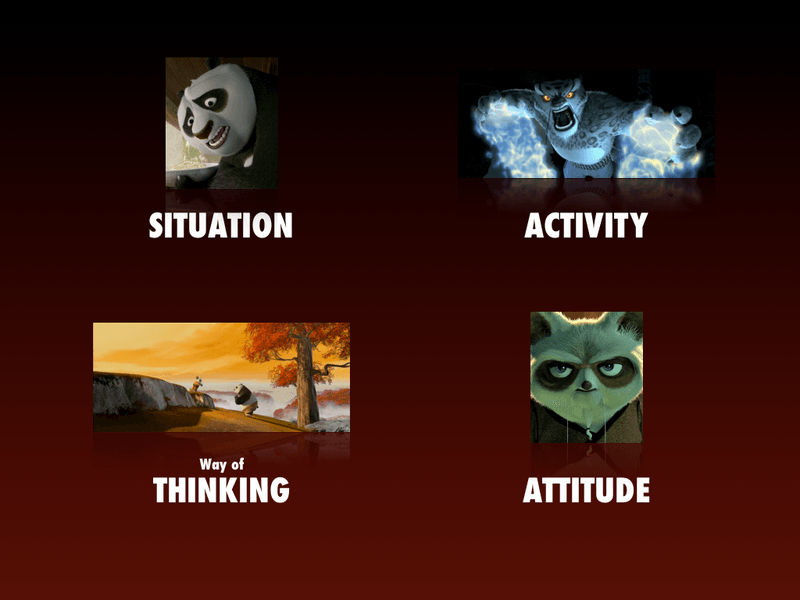 Like Star Wars, The Matrix and How to Train Your Dragon, Kung Fu Panda focuses its areas of conflict on similar problems. Po’s Situation? Beyond his obvious weight issues, Po is the son of the Noodle Soup king—nowhere close to his dream of fighting alongside the Furious Five. Shifu’s attitude? Unlike Morpheus and Ben, this Influence Character believes wholeheartedly that Po is NOT the one. Their Relationship? This time it’s Po trying to do the convincing, in addition to the traditional changes to thinking that come from a mentor. And finally, the Overall Story? More kung-fu fighting and mayhem spurred on by an evil Villain. These repeated patterns of Genre explain why all these films have a familiar ring to them. Regardless of subject matter, stories explores the same KIND of conflict. Their Main Characters deal with Problematic Situations, their Influence Characters strict attitudes, their Relationship between those two characters deals in Manipulations and finally, their Overall Stories deal with Problematic Activities. Want to create a similar feel to these films? Set up a similar construct with your own story. Want to create something different, something a bit off the norm? Mix and match the throughlines into a different combination that an Audience won’t expect. As always, there is nothing wrong with one particular structural base, only options for Authors who wish to infuse their stories with meaning and purpose.